Jump to concerts listing or view concerts on our community events calendar. A year and a half ago Samantha Pollack, the programming director of Washington Performing Arts, found out WPA’s space at the Kennedy Center would be under renovation during its 2016-2017 season. She started looking for a new space. The right-sized venue would have between 500 and 1,200 seats. It would have to allow for afternoon performances. 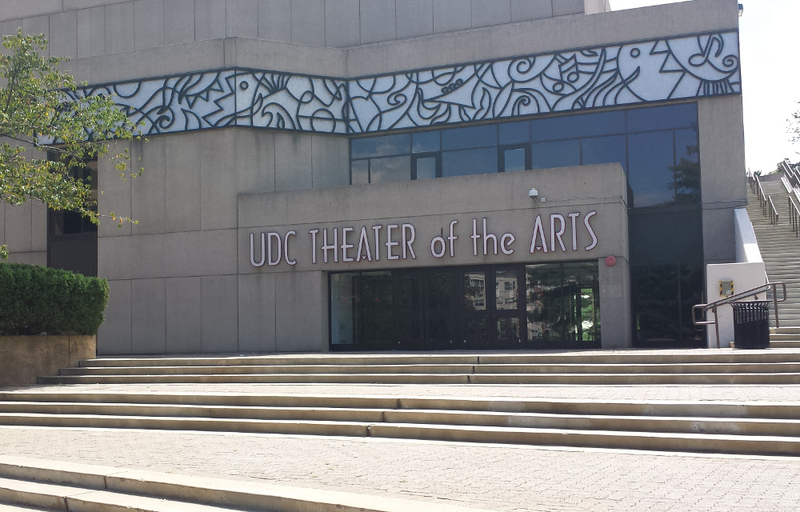 Then she found the UDC Theater of the Arts. The theater, which seats 900, was the right size, had great acoustics and could house WPA’s Steinway piano. She was so taken by the space that she brought representatives of Vocal Arts of DC, Young Concert Artists and Step Afrika! to see it. It was a winner. These groups have all signed on and will be bringing 25 performances to the UDC Theater of the Arts this fall, winter and spring. Peter Russell, the director of Vocal Arts DC, told Forest Hills Connection he is looking forward to being at Van Ness, with easy access to a Metro station, more affordable parking, and restaurants close by. Washington Performing Arts has made a video to acquaint visitors with the theater. Forest Hills Connection welcomes these groups to Van Ness and to UDC. With their assistance, we have created a one-stop shop for concert tickets below. For more information on their efforts to support the performing arts as well as on other performances in the DC area, please visit their websites: WashingtonPerformingArts.org, VocalArtsDC.org, StepAfrika.org and YCA.org. Washington Performing Arts opens its 50th season with the debut of a new and expanded production of Step Afrika!’s signature work, The Migration, based on American painter Jacob Lawrence’s iconic series (displayed at the Phillips Collection and at MoMA in New York). The five concerts of the Virtuoso Series present a platform for emerging and established artists, including soloists and ensembles. Purchase single tickets (sales begin August 24th, click “Purchase tickets” below), buy the series for $168, or if you wish to see three or more Washington Performing Arts shows, create a custom series for savings of 10% off single ticket prices. The Piano Masters Series offers three recitals by some of the most prestigious keyboard artists performing today. Purchase single tickets (sales begin August 24th, click “Purchase tickets” below), buy the series for $148, or if you wish to see three or more Washington Performing Arts shows, create a custom series for savings of 10% off single ticket prices. Rising keyboard talents are presented each year as part of the Hayes Piano Series, established in 1966 in honor of Washington Performing Arts founder Patrick Hayes and his wife, Evelyn Swarthout Hayes. From Pollini to Perahia, Brendel to Bronfman, virtually every notable pianist performing today made his or her Kennedy Center debut on this exceptional series. Purchase single tickets (sales begin August 24th, click “Purchase tickets” below), buy the series for $184, or if you wish to see three or more Washington Performing Arts shows, create a custom series for savings of 10% off single ticket prices. Committed to nurture and promote the classical voice recital, Vocal Arts DC presents an exceptional cadre of chanteurs. This stellar line-up of concerts features some exciting debuts and some very welcome returning artists. Single tickets for non-subscribers will be $50 each, and will be available on and after September 7. Contact Washington Performing Arts at 202-785-9727 or online at VocalArtsDC.org. Or, purchase a mini-subscription of three or more performances for $45 per ticket. A full-season subscription, including all seven shows, is $287, or $41 per ticket. November 15, 2016: The wonderful young lyric tenor Ben Bliss opens our 26th season in the Gerald Perman Fund for Emerging Artists recital. He is accompanied by pianist Lachlan Glen, performing selections from Bellini, Liszt, Vaughn Williams, and Britten. UDC is one of four Washington, DC venues for the Young Concert Artists series featuring extraordinary young performers. Learn more at YCA.org. Purchase single tickets for $38 (see below), or purchase a subscription for all three UDC concerts and more for $30 apiece. If you have trouble purchasing tickets please call 202-331-0405 or email yca@yca.org. This is great news! Can’t wait to attend some of these performances! I tried to buy the Step Afrika tickets, but it said I had to buy tickets to two more concerts. I will try the box office tomorrow. I got the same result. Please let us know what the box office tells you. Thank you! Violeta, WPA now tells us single-use tickets go on sale Wednesday, August 24th. I am changing the information above to reflect that. Thank you for the heads up!